Someone should have thought through the optics on this, but given her reputation as a screaming harpy, I doubt any of her staff wanted to cross her. 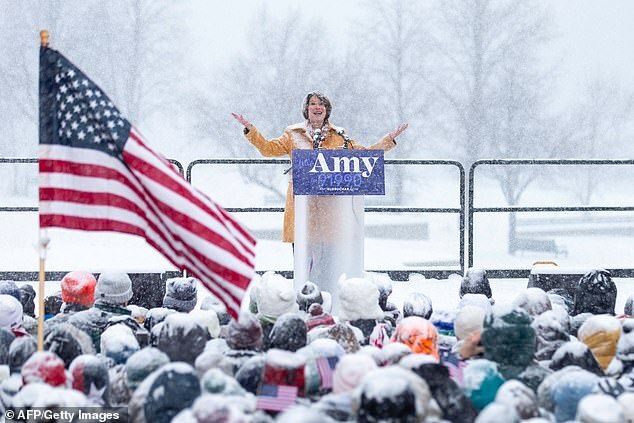 Sen. Amy Klobuchar joined the Democratic presidential field on Sunday and was welcomed to the competition with a tweet from President Donald Trump, who mocked her for talking about global warming in her speech while giving it in the snow. ‘By the end of her speech she looked like a Snowman(woman)!,’ he sniped about the woman running for the right to take him on in 2020. Klobuchar made her announcement on a snow-filled day in Minneapolis, in a speech that countered the president’s policies on climate change and immigration along with knocking his divisive tone in politics.